signotec GmbH will present new hard- and software solutions for evidence-proofed signatures at the CeBIT 2017 in Hall 3 at Booth D29 in Hanover. The special issue about signotec: Handwritten signatures which are either captured by self-produced signature pads or mobile devices. Document integrity and authenticity of the signer are the subjects in which signature specialist signotec offers patented unique features. signotec's large product portfolio will be supplemented by the new 10.1” device “Delta” on which A4 documents can be displayed in the original width. The special feature is its availability in two different versions: First, as a full signature pad “Delta Signature Pad” or second, as a pure monitor extension “Delta Pen Display”. With the 10.1” Signature Pad "Delta" you have the possibility to interact completely via an SDK, i.e. to upload PDF documents and pictures or to display texts, graphics and buttons. PDF documents can even be scrolled comfortably with the pen. It goes without saying that the biometrics can already be encrypted in the pad using a public RSA key. Likewise, the fact that documents are signed in the pad and thus the highest possible evidential value is unfolded. 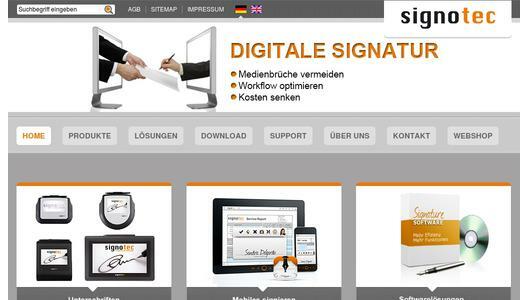 In this version, it is unique in the market and signotec is thus once again demonstrating its technological leadership. Moreover, the Delta Signature Pad comes with the “secure mode”, which only uses a reduced amount of data for the real-time display on the PC monitor. The biometric characteristic of the signature cannot be reconstructed therefrom. The "Delta" is the ideal solution for banks, government agencies and companies where complex documents need to be read before signing. Another product innovation is the "Delta Pen Display", a 10.1” monitor extension with pen input. The main screen can be duplicated or expanded using the monitor settings of Windows. It is geared toward customers who back off from an increased integration effort. There are no possibilities for interacting with the display, but of course with a simple SDK and a Wintab-interface to capture the signature. “signoSign/2" has been considerably extended and complemented by many functions. This includes the "interactive mode" for the “Delta”, which allows a free signature on the document without having to create signature fields. Another new feature is the formation of a group of signature fields, which is very helpful when handling complex documents with many signatures. The interface device with touch or stylus input has also been significantly improved and is aimed at customers who do not want to use a signature pad. A new feature of "signoSign/2" is the interface to "signoStorage", a web-based follow-up application that can be used to defer documents that could not be finalized in a single operation. It can be used to implement signing processes in a workflow. 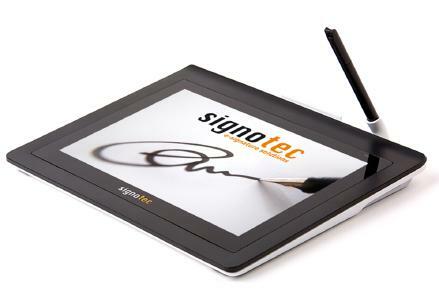 The special feature of the server-based "signoSign/Universal" is the support of mobile devices as well as the possibility of using stationary signotec signature pads. With the TÜV-certified application, you can sign documents with your own mobile device on the go, for which a personal signature is necessary without having to use a signature pad. The application works on the client side without additional software and supports all common browsers such as Internet Explorer, Firefox, Safari or Chrome. For iPad- or Android-users additional signature apps are available. These apps can, but do not need to be used. With signoSign/Universal, workflows without media discontinuity can be realized even on the road. signotec’s signature process ensures that the characteristic signature information, such as the writing speed and pressure, is stored in the document, which can be verified by a handwriting expert similar to an original signature. The signed document can then be integrated and archived directly into other electronic workflows without a media break. The data transmission of the signotec pad to the PC is, of course, encrypted. However, the outstanding RSA signature and encryption mechanisms in the pad itself are unique. By transferring the signed, electronic documents into the workflow of a DMS, costs are reduced, processing and throughput times are accelerated and abuses are prevented. With the hardware and software solutions, signotec manages to realize efficient and cost-effective business processes in the digital office like no other, especially as both come from one source. This year's CeBIT will take place from March 20th - 24th, 2017 in Hanover. You will find signotec in the usual place in Hall 3 at Booth D29! Signature innovations and intelligent software solutions for mobile and stationary use, users can sign in the familiar way, optimize business processes, authenticate people and produce legally valid documents. Electronic documents signed this way can be checked without technical outlay by anyone anywhere and at any time. Thanks to own resources, innovation and many years of experience, the company already set many, strategic milestones on the path to success. The decision to not develop only software solutions but to also produce hardware for digital signature capturing is a good example. 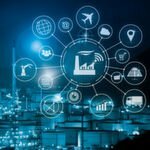 Both, soft- and hardware guarantee a unique and data protected interaction that has already been confirmed by numerous patents. With signature solutions from signotec, signing remains as easy and secure as ever. However, the signature is given in the electronic document itself. As a result, cost-intensive and time-consuming media discontinuities are avoided, while the electronic documents are protected by the digital signature and can be verified as genuine. The encryption of biometric features within the signature pad is characterized by patented safety mechanisms and high quality capturing. With the Made in Germany label, the company takes an outstanding position on the market and supports the middle class in Germany. signotec's valued partners and customers include not only German but international industry customers, retail chains and companies, financial service providers and banks, administrative offices, the healthcare sector, insurance companies and brokers. A globally acting partner network includes experienced and well instructed IT experts. By bringing together core competencies, we create synergies to the benefit of all. The common know how allows us to provide holistic and integrated business solutions according to specific customer requirements. signotec's achievement in the various industries proves that it is capable of delivering complex, integrated solutions at a high level in terms of quality and quantity. The signotec GmbH is managed by the directors Arne Brandes and Gunther Hagner at the locations Ratingen and Rodewald.